Audio Preview: Here, you can set a windows playback device (headphones, speakers, etc.) to output the final mix of your XSplit audio. This is good for helping you determine if you have a proper audio mix before going live. Please do not to set this to your default playback device. System sound: This is the audio XSplit will capture from one of your windows playback devices. We recommend you leave this set to “Default Speakers.” You can also set a delay on system sound as well as boost the audio. Microphone: This is the audio XSplit will capture from one of your recording devices. Like system sound, you can also set a delay as well as boost the audio. If you set a delay on your microphone, make sure to use the same value that you use in other devices like your webcam to keep them in sync. 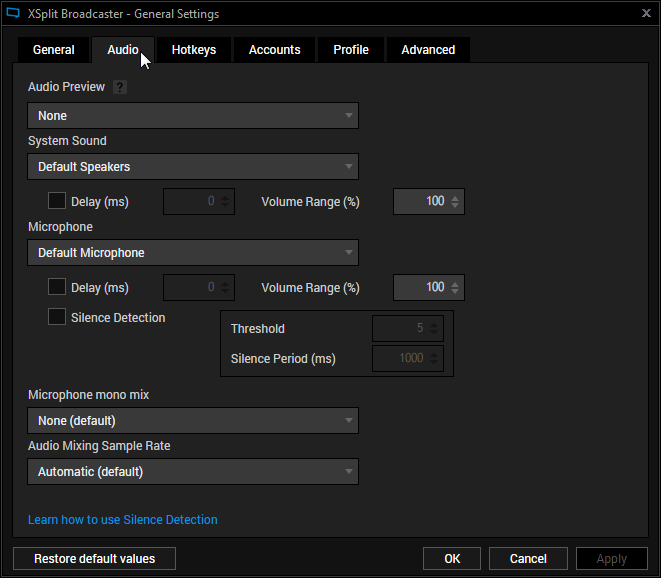 Silence Detection: If you have problems with “background noise,” then you may want to give this a try. Type in the number of decibels in Threshold (decibels are how sound is measured) where you would like your microphone to stop picking up “background noise” and the number of milliseconds in Silence Period you would like your microphone to remain muted. Microphone mono mix: If you have a microphone that only sends audio to either the left or right channel, then you can use this feature to duplicate the audio onto the other channel.